CLEMSON, S.C. (AP) — Trent Forrest said Florida State entered the season hoping to make history. The 16th-ranked Seminoles certainly did that at Clemson. Florida State used its size, strength and speed to keep the run going against the Tigers, holding on after seeing an 18-point edge cut to 59-52 with eight minutes left. That’s as close as Clemson (15-11, 5-8) would get in dropping its third in a row and getting swept by Florida State for the second time in three seasons. Kabengele led the way on both sides of the ball. He hit 9 of 13 from the field, blocked two shots, and his rebounds were a season high. Then again, Clemson had trouble stopping much of anything Florida State did around the basket. The Seminoles’ starting center in 7-foot-4 Christ Koumadje went 4-of-6 shooting for 10 points with seven rebounds and a pair of blocks. That wasn’t the case early on in ACC play as Florida State started 1-4 with losses at Pitt and Boston College. It got things in gear against Clemson with a 77-68 win on Jan. 22 and has not lost since. “The streak continues,” Kabengele said with a smile. Florida State coach Leonard Hamilton is grateful for his team’s successful run. He’s even happier that his players are gelling so well and improving their play every time out. The streak? It won’t help a bit, he said, in his team’s next contest at No. 8 North Carolina on Saturday. “In reality, it doesn’t mean anything other than people are probably going to play us a little bit harder,” he said. The Seminoles took control after Clemson closed to 23-21 on Marcquise Reed’s 3-pointer with 6:18 left in the half. Florida then went on a 15-2 surge the rest of the half with Kabengele hitting three buckets and Walker landing a 3-pointer. 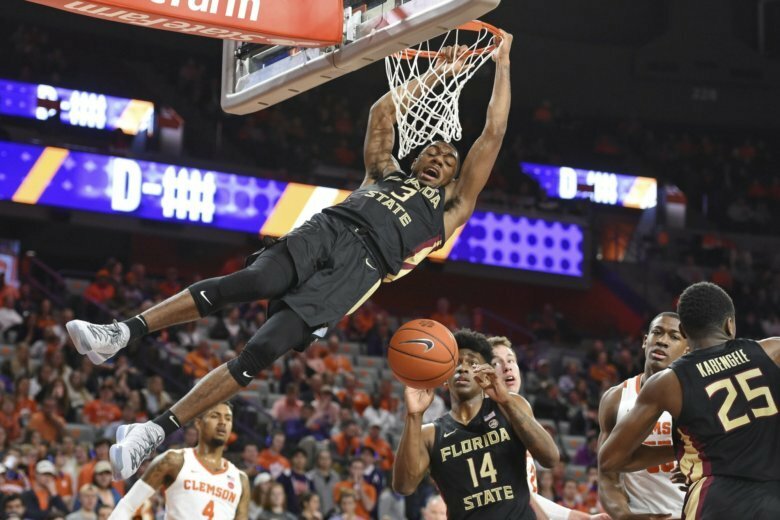 Florida State: The Seminoles’ offense was relentless with guard Trent Forrest and Terance Mann pushing the ball at the basket where their bigger teammates like Kabengele and Koumadje took control. It’s a formula that works well in the postseason where Florida State reached the NCAA’s round of eight last year. Hamilton said his team’s early ACC troubles were in part blending in newcomers along with injuries to mainstays like Phil Cofer, who missed the first win over Clemson last month. Hamilton was confident his team would recover and anyway, “there was a high probability we wouldn’t go undefeated in ACC play,” he said. With all the focus on fabulous freshmen, Florida State and Clemson had a throwback game with a combined seven players in the two starting lineups as seniors. The Seminoles’ senior starter were Cofer, Mann and Koumadje. Clemson had four starters in Elijah Thomas, David Skara, Reed and Shelton Mitchell.